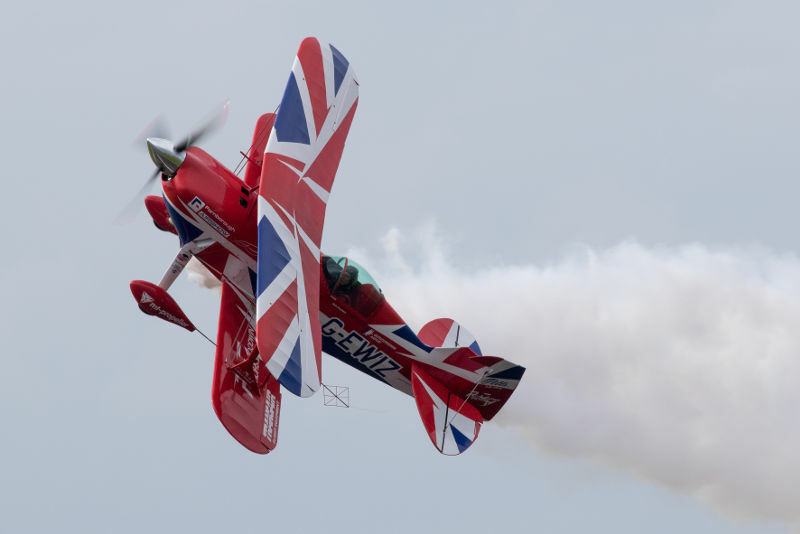 Richard Goodwin, a former military and commercial pilot, returns to Wings & Wheels on Saturday 26th and Sunday 27th August flying his specially modified Pitts S2S biplane, known as G-EWIZ, to wow fans with stunning aerobatic displays. Using his experience and skills, Richard combines classic manoeuvres with high energy gyroscopic forces to produce a very dynamic routine that leaves the crowd gasping in wonder that he stays in the sky! This year Richard has something rather special planned with a knife edge formation on the runway with a classic car – don’t miss it! G-EWIZ is powered by a six cylinder, 8.5 litre engine producing over 300bhp and pulls forces of plus 6g and minus 5g at speeds of over 200mph. The Pitts S2S first flew in December 1977 and is a unique single-seat version of the classic Pitts Special aerobatic biplane powered by a fuel injected Lycoming engine. It is amazingly agile and capable of spectacular tumbles and a different style of high energy aerobatics. The plane’s unique paint scheme was designed and created by Mirco Pecorari at Aircraft Studio Design. Visitors to Wings & Wheels can also enjoy other air displays including the Red Arrows, Eurofighter Typhoon, Battle of Britain Memorial Flight (two Spitfires and Lancaster), Chinook (Saturday only), Apache Display Team with pyrotechnics, Tigers Parachute Team, Blades, B25 Mitchell and much, much more. 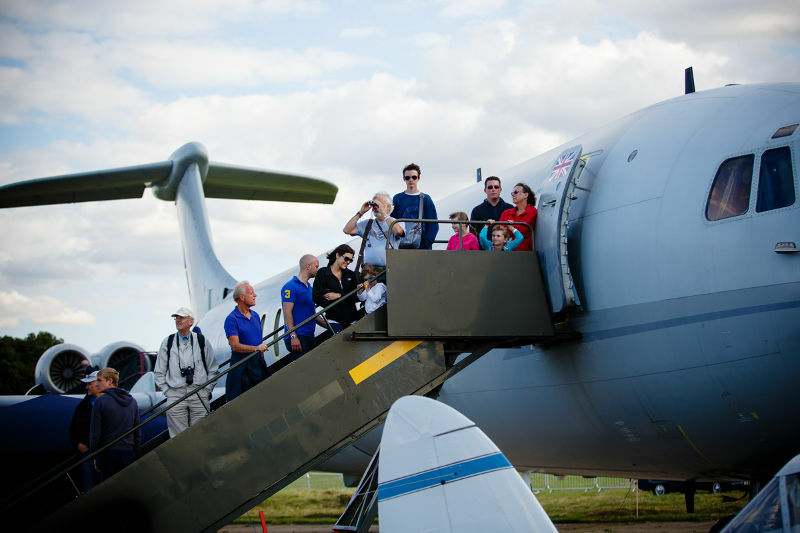 The ‘Wings’ of the event would not be complete without a close-up inspection of all the weekend’s visiting aircraft including the Royal Navy Wildcat, RAF Puma, Apache, Dunsfold’s resident Sea Hawk, and Hunter as well as the infamous Boeing 747, the Brooklands VC10 and Aces High DC3, all open for tours. The excitement and anticipation doesn’t stop at the main displays as the 32-acre public arena is bursting with a huge variety of interactive attractions containing all you need for a great family day out. The show arena boasts, kit-plane demonstrations, military outlets and displays, static aircraft, fairground and over 80 retail outlets selling a wide variety of products and gifts. Shopping in the arena includes a craft marquee full of craft gifts and tempting tea time treats to take home as well as a *New* Vintage Market with hair and make-up, clothes and collectables. We are delighted to confirm that O’Brien’s Flying Circus has joined the five-hour air displays line-up at Wings & Wheels on Saturday 26th And Sunday 27th August. Brendan O’ Brien and his team have created an awe-inspiring display which is a mix of barnstorming and innovation, combining the art of crazy flying with the precision required to land on the world’s smallest runway – a truck! With over 13,000 flying hours, on over 300 types of aircraft, with a licence to fly every kind of aerial machine, internationally renowned aviator Brendan O’Brien will not only be in the display but will again resume his position in the commentary box in order to impart his aircraft knowledge to the crowds at this year’s Wings & Wheels. Brendan has developed several memorable and unusual firsts for the UK and European display circuit, including the Fournier Duo Aerial Ballet with Unipart and the famous Truck-top Landing act with Iveco Ford. It is the Truck-top landing act which Brendan will be performing at Wings & Wheels in the Piper J-3 Cub. Brendan holds in excess of 200 world records for flying – more than any other individual pilot – all ratified by the FAI in Paris and entered in the Guinness Book of Records. He is also a qualified flying instructor on fixed wing aircraft, helicopters, Microlights and gliders, a CAA flight examiner, display authorisation evaluator, test pilot and medallist of the Royal Aero Club of the UK. He has flown on every continent in the world, including Antarctica. The Wheels Zone is a petrol heads delight with a host of car and motorbike clubs, a Stunt Zone with two and four wheeled dramatic action, monster truck rides and a Motoring Demonstration with over 100 vintage and modern supercars showing their metal on the infamous Top Gear Track. This Saturday 26th and Sunday 27th August we’ve got some truly spectacular cars, including one of the original hyper cars, the Lamborghini Diablo. This 1993 car kicks out over 480bhp from its screaming V12 engine. The name ‘Diablo’ in Spanish means Devil and this car certainly lives up to that name and with only 900 made, it is a real classic. Joining the Diablo is the latest Hyper car, the Ferraris LaFerrari. Powered by a V12 engine producing 789bhp, it is supplemented by a Hybrid KERS unit which pushes the power to 950bhp. This is the fastest production Ferrari to ever lap their Fiorano Test Circuit and can reach 186mph in 15 seconds! That is four seconds quicker that it takes Bolt to run the 200m. Koenigsegg, a Swedish motor car company founded in 1994, set out with the aim of producing a “world class” supercar and we are thrille d to have two at the show on Sunday. The Agera N, only one of one, and the Agera R which is no. 18 of 18. These monsters produce over 1,000bhp from a twin turboed 5 litre V8 engine which allowed the car to break six land speed records in 2011 including 0-186 in 14.53seconds, that’s quicker than Ferraris LaFerrari. Three American NASCARS will also be participating in the Motoring Demonstration. These three monsters of the States will thunder up the runway powered by their V8 Engines producing over 800hp. Next up is the Bentley 4.5 Ltr Le Mans. This amazing car from 1928 is affectionately known as Burbling Bertie by his owner Richard Wade. Bertie was a works development car for Bentley before being sold privately and turned into an estate car during the war. 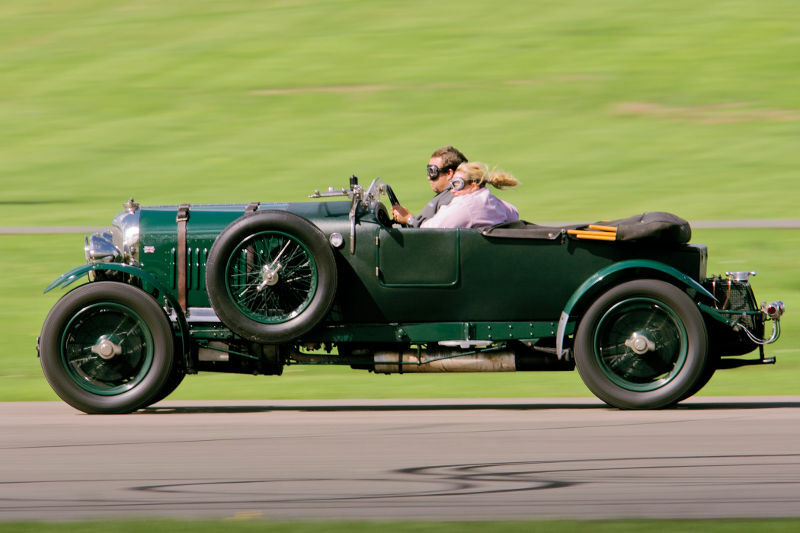 After the war Bertie was restored to his original specifications and has since been extensively rallied, sprinted, displayed and lightly raced all over Europe at places such as The Le Mans Classic and Montlhery. Bertie’s Top Speed is approximately 100mph, depending on which way the wind is blowing! We are delighted to be welcoming the Honda Civic Type R Black Edition, one of only 100 special editions of the iconic turbo charged Civic Type R. The car is painted all in black, set off with red wing tips and produces over 300bhp through its front wheels from its turbocharged 2ltr engine. The Civic Type R is the fastest front wheel drive production car with a lap time around the Nordschleife in 7:43.80 and has a top speed of 160mph. It wouldn’t be right to have a motoring event without a McLaren on the track and this year we have a McLaren 570S flying down the runway. The 570BHP engine has impressive power able to achieve 0-60mph in 3.2 seconds, 0-100mph in 5.3 seconds and 0-125mph in 9 seconds. Russ Carpenter Racing is bringing their 1970 Grenade Dragster, one of the first all British built rear engine dragsters. Built in 1970 Russ won numerous British and European championships from the mid 70’s until 1989 including being crowned RAC Champion 1982 and winning the first two European Series Championships in 1987 and 1988, before being outlawed from racing for being too fast. He was an ambassador promoting Drag Racing all over Europe visiting many towns in France including racing at Le Mans, Sweden, Hockenheim in Germany, the A1Ring in Austria and Zandvort in Holland. He holds two World Records for the first all British car and the first car under 5.5 litres to run a standing quarter mile in less than 8 seconds anywhere in the world, as well as numerous track records in his class. This incredible car will be on static display at Wings & Wheels this year next to the Wheels Zone Information point, it is one car not to be missed! Visitors to Wings & Wheels can also enjoy other air displays including the Red Arrows, Eurofighter Typhoon, Chinook (Saturday only), Apache Display Team with pyrotechnics, Tigers Parachute Team, Blades, Sally B, Brendan O’Brien’s Flying Circus, Strikemaster, Vampire Duo and much, much more. 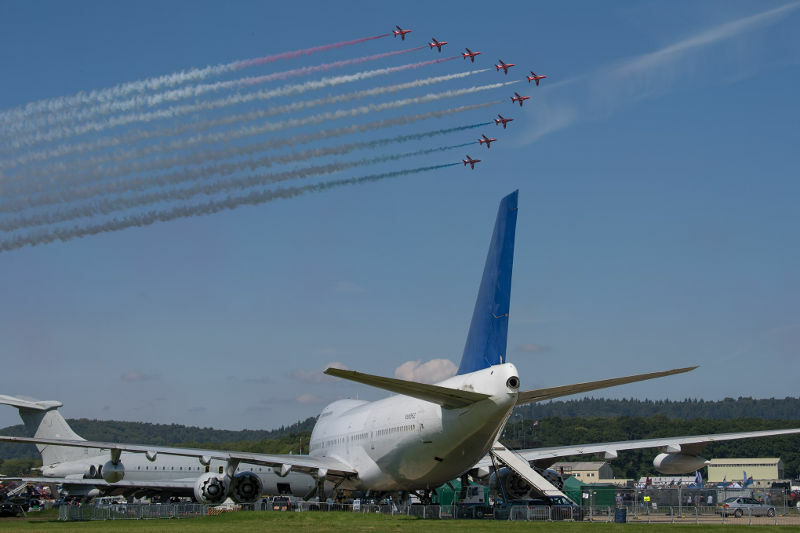 As well as fantastic displays in the air, the Wings Park at Wings & Wheels will have some impressive aircraft for visitors to get up close and personal too. Attending both days is the Royal Navy Wildcat Helicopter, AAC Apache Helicopter, RAF Hawk T2 and RAF Tucano as well as the aerodrome’s resident 747, Sea Hawk and Hunter, Brooklands VC10 and Aces High DC3. The Wildcat Maritime Attack Helicopter is the latest generation of multi-role helicopter specifically procured to operate from the frigates and destroyers of the Royal Navy. Replacing the Lynx Mk8, the Wildcat has a more powerful engine allowing it to be flown in extreme conditions all year round. It is also equipped with a more robust fuselage, a high tech interactive display and a new radar system that provides 360-degree surveillance. Not content with putting on an explosive display in the sky, the Apache will also be on the ground. Designed to hunt and destroy tanks, the Apache attack helicopter can operate in all weather, day or night and detect, classify and prioritise up to 256 potential targets in a matter of seconds. It carries a mix of weapons including rockets, Hellfire missiles and a 30mm chain gun, as well as a state of the art fully integrated defensive aid suite. The Hawk has a rich history at Dunsfold Aerodrome and is also the aircraft the Red Arrows fly. The Hawk T TMk2 on static display is a fully aerobatic, low wing, transonic, tandem 2-seat training aircraft with mission avionics, representative of front-line aircraft. The Hawk has tandem seats, with full controls available in the front and rear cockpits. The aircraft’s ‘glass cockpit’ avionics suite provides a realistic advanced fast jet training platform. The RAF Tucano will be parked up and on display with the rest of the aircraft at Wings & Wheels. 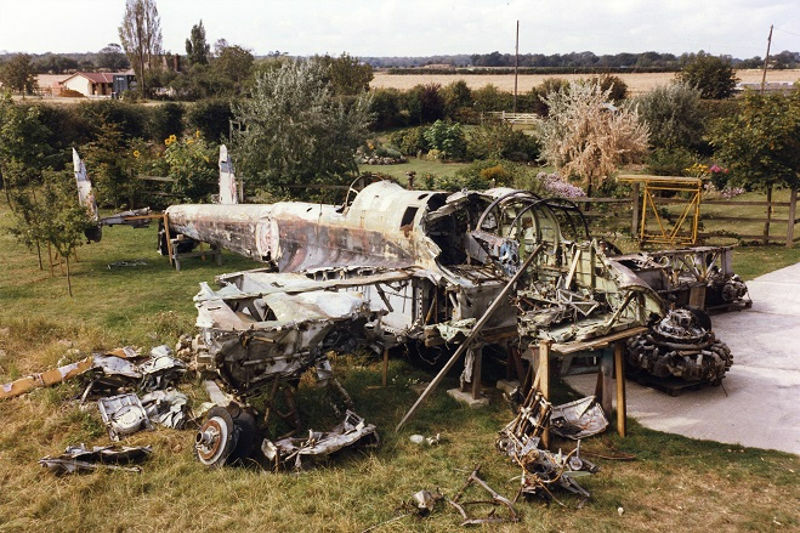 Operated primarily from No 1 Flying Training School, at RAF Linton-on-Ouse, to provide basic fast jet flying training to RAF and RN student pilots, and basic WSO training to all potential RAF WSOs. The aircraft is powered by an 1150shp Garrett Turboprop engine, has a maximum speed of 300kts (345mph) and can maintain 270kts (310mph) at low level. It can operate at up to 30,000 feet and has an initial climb rate of 4000 feet per minute. 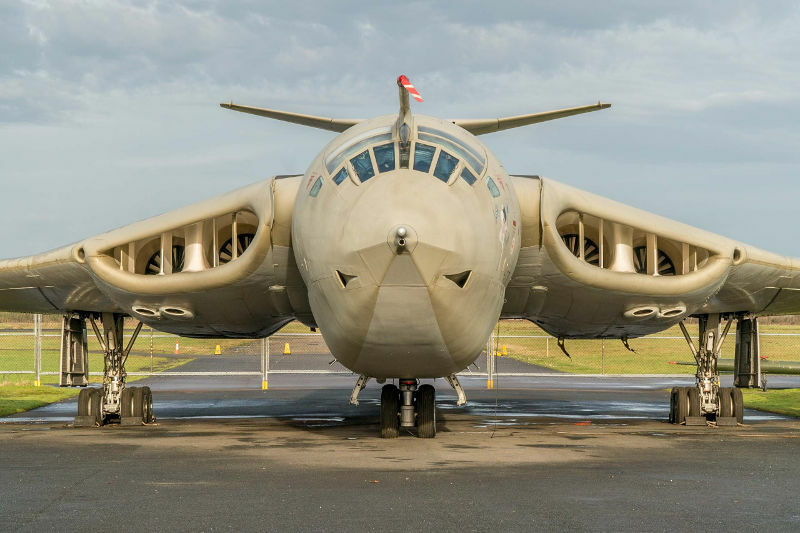 The VC10 will also be completing much anticipated engine demonstration runs twice daily in the Wings Park. Bring your ear defenders and prepare for the ground to shake! Visitors to Wings & Wheels can also enjoy other air displays including the Red Arrows, Eurofighter Typhoon, Chinook (Saturday only), Apache Display Team with pyrotechnics, Tigers Parachute Team, The Blades and much, much more. The Norwegian Air Force Historical Squadron are the latest addition to the Wings & Wheels line-up on Saturday 26th and Sunday 27th August as they display their two de Havilland Vampires. Loud and exciting, the first de Havilland Vampire FB.52 on display is the export version of the Mk 6 of which 101 were built and 36 exported to Norway. The aircraft is now in the Royal Norwegian Air Force markings to represent Vampire PX-K, serving at the 336 squadron in the early 50s, Norway’s first pure jet fighter squadron. The second de Havilland Vampire T.55 was the export version of the DH 115 trainer in RAF service known at the T.11. 216, six of which were exported to Norway and in use from 1952 to 1955. The aircraft is now in the Royal Norwegian Air Force markings to represent Vampire PX-M, a two – seater serving with 336 squadron. The Norwegian Air Force Historical Squadron was founded in 2008 and is based at Rygge Air Base Norway. 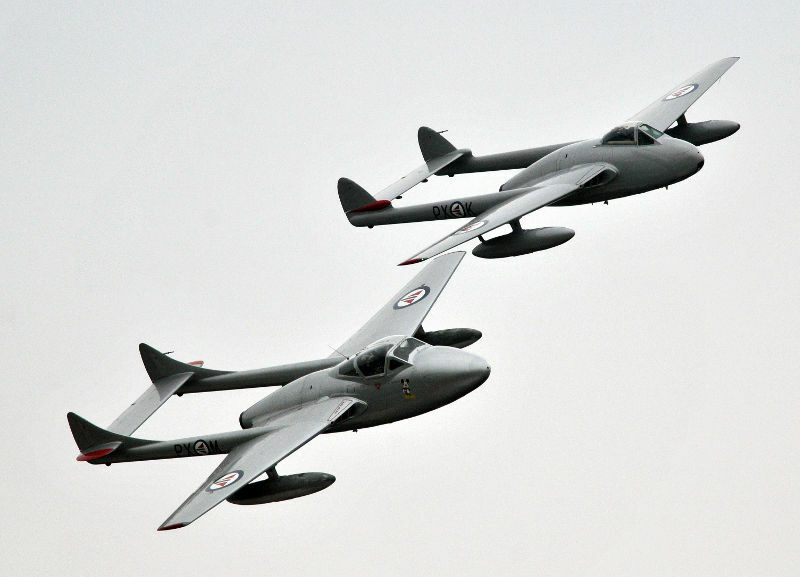 Their first aircraft was the D.H. Vampire, PX-M which was acquired in 2005. The de Havilland DH.100 Vampire was a British fighter jet developed during the Second World War. It was designed to harness the newly developed jet engine and entered service with the RAF in 1945. It was the first fighter jet to be powered by a single jet engine. 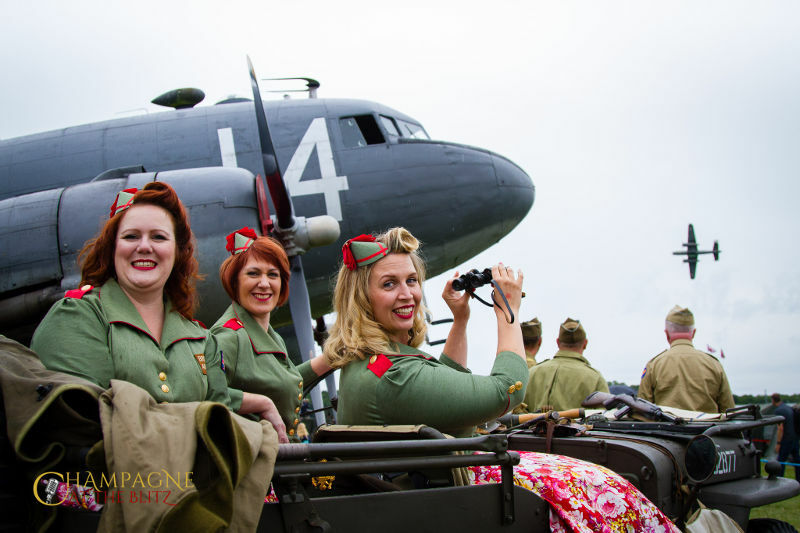 Complete with vintage microphones, beautiful harmonies and victory rolls, Champagne at the Blitz will be entertaining the crowds across the arena and into the evening at Wings & Wheels on Saturday 26th and Sunday 27th August. Taking you for a trip down memory lane, back to a bygone era, the vintage styled singing trio will be giving all the best loved classics of the wartime era and beyond, a heartfelt revival. With their signature red lippy, eye catching costumes and authentic seamed nylons, Champagne at the Blitz will showcase their repertoire of all the best loved songs from the 1940s, 50s and more, including modern tracks you can hear on the radio today. In full three-part harmony and finished off with a twist of ‘Champagne’, they will bring you wartime songs such as ‘Alexander’s Ragtime Band’ and ‘I’ll be with you in Apple Blossom time’. Bringing the original sounds of The Andrews Sisters back to life live on stage their set will also include popular 50s tracks such as ‘Be My Baby’ and ‘Why do fools fall in love’ for anyone who is ‘In the Mood’ to get up and ‘Boogie Woogie’ along with them! Jenny, Caroline and Sarah have sung together for many years and formed the group by popular demand two years ago. Within that time, they’ve performed at festivals, private functions, charity events and even appeared live on Good Morning Britain. On 17 August 1917 General Jan Smuts presented his recommendations to the War Cabinet for the creation of an Air Ministry to control and administer all matters in connection with air warfare of every kind. Smuts report specified that the new ministry should proceed to work out the arrangements for the amalgamation of the two (Air) services; the Royal Flying Corps (RFC) and the Royal Naval Air Service (RNAS) and for the legal constitution and discipline of the new Service. Forged in the crucible of the First World War, the story of the Royal Air Force has shaped the modern world. By inspiring technological development, pioneering cultural change and pushing the boundaries of human achievement, the RAF has touched the lives of millions around the globe. With the services 100th anniversary approaching next year, the RAF Museum is hard at work preparing for the historic occasion by delivering a £26m RAF Centenary Programme at its London site, funded by the Heritage Lottery Fund. The new exhibition halls at London will be opening in Summer 2018 as part of the wider calendar of national RAF events. Until then it’s business as usual at both RAF Museum sites, open daily from 10am and admission is FREE.